A weekly event called “Community health run or walk” has been created by some Canterbury DHB staff members. It's all about meeting others in the community and getting healthy together! Most of us believe that being part of a community and connecting with others is really important. Like many things though, it often falls by the way side in our busy lives. We know it’s something that we need to keep working on; and with the opening of new buildings in our local community, we’ve been given wonderful spaces which compliments Hagley Park and the gardens. It’s also bought new people into our city. We’ve got an opportunity to bring our people together and enjoy these spaces. Cost: Gold coin donation. All proceeds will go to a local charity. The event will start and finish outside the Pegasus Arms - located in the middle of the city's health precinct. The majority of the surrounding buildings are related to health but there are other groups or business in the area. The event hopes to bring laughter, smiles and plenty of conversations. Runners or walkers will leave the Pegasus Arms on a 3km, 5km or 8km course around or through Hagley Park. Cards and a timer will be provided so participants are able to record their time (if interested). It’ll also be for participants to sign that they took part. Families and dogs are welcome and encouraged to participate. 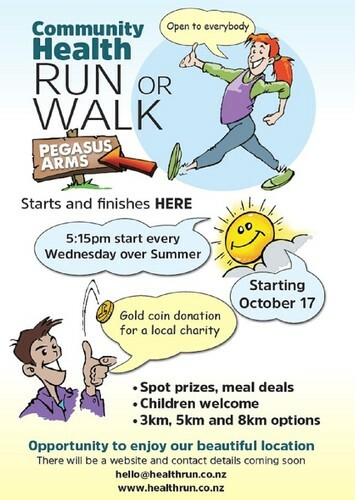 Those who can't make the scheduled event can complete their weekly run or walk any day or time as the cards will be kept at the Pegasus Arms. It’s hoped that prizes will be given out over the period of several weeks for regular participation. Email hello[at]healthrun.co.nz for more information.